What ICD-10-CM Promises - Outsource Management Group, LLC. 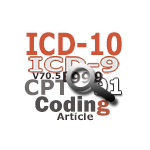 The 30 year old medical billing ICD-9 coding system will soon be thrown out the window. This old system has long been outdated for our growing knowledge of medicine and medical treatments. We now know a lot more about diseases then we did thirty years ago. We also have discovered many new conditions and variations of old conditions. The new ICD-10 medical billing system promises great change to the health field. Over one hundred modern countries now use the ICD-10 medical billing coding system. The United States currently uses the ICD-9 system. With the old ICD-9 system it is very difficult transferring information back and forth between these other countries. For example, using the medical billing ICD-10 system would make it much easier to share information about possible SARS or Chicken Flu outbreaks. On a much smaller scale, the ICD-10 will help us put a more exact cost on specific medical treatments. The new coding system will have many, many more descriptions of medical conditions. That means when a medical billing personnel codes a visit, the code will be a lot more accurate then in the ICD-9 version. Currently, the government is trying to use SNOMED-CT as a medical clinical language. Unfortunately, with the use of the medical billing ICD-9 coding system, SNOMED-CT will never be possible. The adoption of the new medical billing ICD-10 codes will make SNOMED-CT more feasible. Although the medical billing world will be turned upside down with the implementation of a new coding system, it will benefit everyone in the long run. The new ICD-10 coding system helps us to more accurately describe medical conditions and allows us to more easily communicate possible medical threats with other countries. The new ICD-10 medical billing coding system has a lot to offer the USA medical field.